Neck Pillow | Cervical Support Pillow | Pillow for Neck Support | Neck Pain Pillow Questions about the Right Neck Pain Relief Product ? 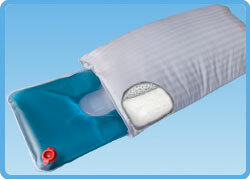 The Water Neck Support Pillow Deluxe is a great Support Pillow that responds to your changing body positions at night. Its comfortable and supportive at the same time. This pillow has a outer cushion that has a built in lobe for extra neck support. You can easily pull out the water chamber to fill to your desired support level. 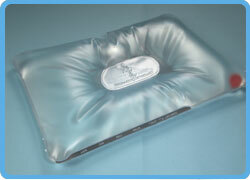 Simply use the guide along the edge of the water chamber to choose how firm or soft you want your pillow to be. If its too firm, Remove water. If its too soft, add water. The Water Chamber has a special displacement panel that quiets the sound of the water. It provides you with mild support by allowing the water to better comform to your head and neck. You can use the Water Neck Support Pillow Deluxe with or without water- two pillows in one; A water pilllow or a fiber support pillow. This pillow is great for someone who has headaches, neck pain or snores. Helps to alleviate head and neck pain…even snoring by clearing the passageways. Periodically rinse with bleach water to maintain maximum freshness. Thank you for visiting us at the Neck Pain Relief Shop. We always trying to help you get the best product that you need for your pain and discomfort. Whether you suffer from an acute condition or have chronic pain, we have many pain relief products to help you live your life as best as possible. There are many neck pillows available on the market today. Only one is going to to be right for YOU. Choosing the right one will make all the difference in the world. Same goes for sleeping aids, hot and cold therapy products, neck traction units, and even positioning products. If you need help making the right decision about what pain relief product is best for your, contact us via email or telephone. Copyright © 2003-2016 The Neck Pain Relief Shop, A Division of Arc 4 Life. Doctors and Health Professionals: Visit the Chiropractic Warehouse for bulk discounts on pain relief products. All rights reserved. Please contact us at info@ neckpainreliefkit.com if you have any questions or concerns. Port Orange, FL 32129 Information provided on this website is derived from the writings of doctors and research scientists.